My good friend from college Blair came to visit me a few weeks back. She was my first non-family member Yankee visitor and it was her first time in the south. EVER. It was a pretty big deal. I picked up Blair at the airport early Wednesday afternoon and went over some ideas of things to do and try out during her stay. Even though it was a little chilly (I’ll have you know it was 80 degrees the weekend prior), the afternoon she arrived was supposed to be the warmest of the days while she was here so I suggested we pack up a picnic and head out to Arrington Vineyards. I had never been before but had been told by many people that I should go if I had the chance. We packed up supplies in the largest beach tote known to man, picked up some cheese and olives at Whole Foods and headed on our merry way. 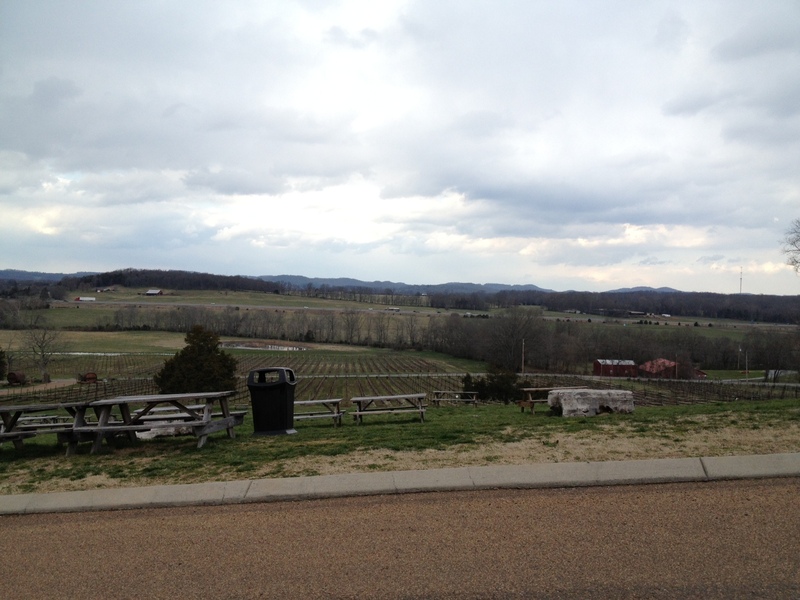 After a scenic drive away from the city, we arrived at Arrington Vineyards for our free wine tasting. Our server gave us his spiel, telling us we could try up to 8 different wines. I asked Blair how many she was going to try, to which she replied, “8! I’m on vacation!” I like the way she thinks. No wonder we’re friends. We were both starving and decided to nosh on the cute little crackers offered at the tasting to cleanse the palate between wines. Blair referred to them as cracker pillows, because they did indeed look like pillows made out of a cracker. Our server agreed and we giggled about it for a good 5 minutes. For the record, this was before we had sampled any wine, which was unfortunate for Blair who tasted the crackers first. I asked her how they tasted as she chewed for an eternity. Anyway, we tasted our 8 wines and decided on a bottle to purchase and enjoy with our picnic. 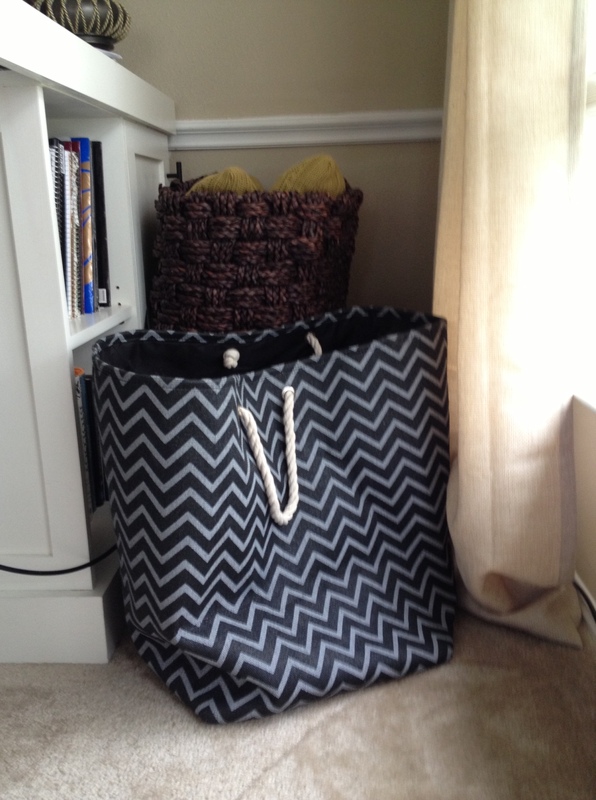 I went to the car to retrieve the picnic and as I walked back up to the porch, I got several comments on my monstrosity of a bag. It really does come in handy on such occasions. 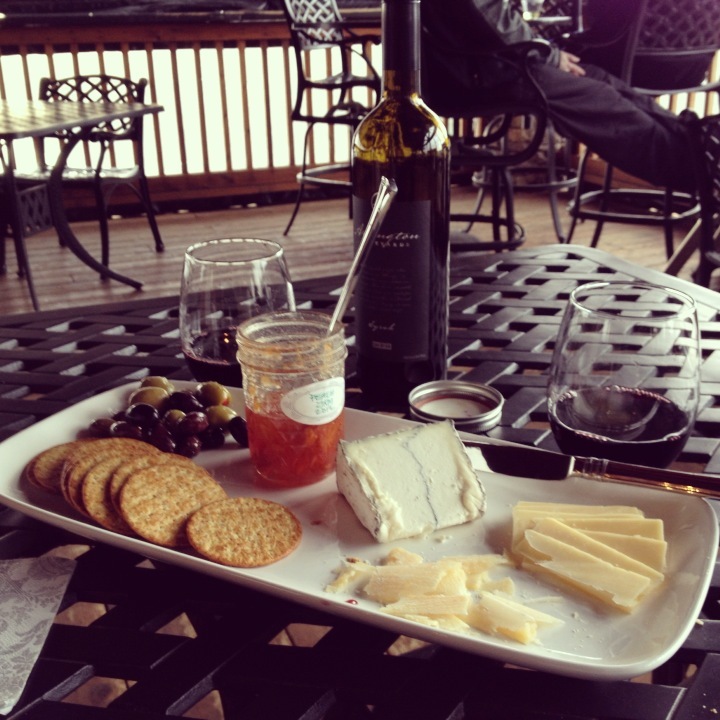 We set up our spread and caught up for several hours as we enjoyed our wine and cheese. The sun began to set on the Vineyard and it was time to pack up and get ready to go downtown for dinner. Normally, if I’m trying to ensure that my guests have a good time and/or trying to convince them to move to Nashville, I take them to places that I have been to and know are worth returning to. I hadn’t been to Arrington Vineyards, but that was a hit so I continued breaking my rules that evening by suggesting we try a new restaurant in town that I hadn’t yet been to. We freshened up and headed downtown to The Row, which had just opened the week before. We arrived to a nearly empty restaurant and were seated in a booth in the corner under some very harsh, interrogation style lighting. We asked if they could maybe dim the light a little, which they couldn’t (poor lighting design) so we asked to move. We were re-seated in a very dark section and began to study the menu by candlelight. From one extreme to the other in the span of 30 feet. The menu had lots of southern classics to choose from. I picked chicken fried chicken with cheese grits and bourbon sweet potatoes and Blair got the BBQ, brussel sprouts with bacon, and fries. 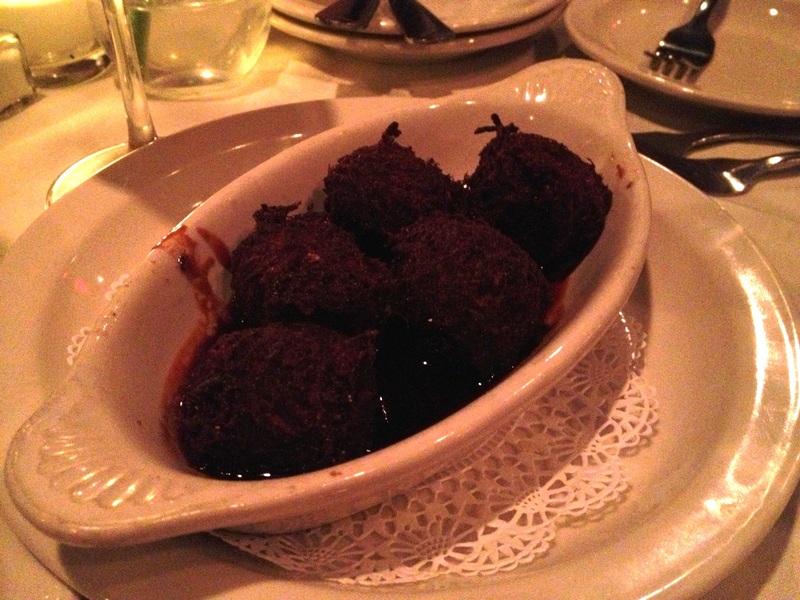 What the restaurant lacked in atmosphere it sadly did not make up with its food. While it wasn’t terrible, it wasn’t special. I know better than to order fried chicken with two grandmothers from Kentucky. Shame on me. I’m sure the restaurant would be more pleasant if it were full, but I’m not in a hurry to go back and neither is Blair, particularly if she has to come all the way from Boston. So maybe I should have quit while I was ahead with the blind adventures. Thankfully, Blair was willing to write off that one since we started off well at the Vineyard and had several days of pre-approved adventures ahead. And that was just the first 8 hours. Stay tuned for parts II & III. Somehow, I have lived in Tennessee for a year. How did that happen? This past Saturday marked the anniversary of completely uncharacteristic move 1100 miles south. In a way, it seems this year flew by, and yet living in Boston seems a long way back. I didn’t know a soul when I moved here, but of course I received a warm welcome. It is the south after all. I’ve made many wonderful friends in the last 12 months. I’ve gotten to see my grandparents and extended family more than ever. I’ve discovered I like bluegrass. I’ve put 17,000 miles on my car. I’ve experienced a tornado warning. I’ve taken thousands of pictures of the sky. I haven’t done yoga once. Words like “you’re fine” and “y’all” have become fixtures in my vocabulary. My style has become more eclectic and less preppy. Though it would be a serious stretch to call me an extrovert, I’m more outgoing and chatty than I used to be. I like to get out more. I don’t have a TV in my room and I don’t miss it. I still haven’t bought bar stools so I don’t have a proper place to eat a meal. I cook maybe once or twice a week. I’ve decided I’m not over the city living as much as I thought. I’ve stopped drinking soda. I like dogs more than I used to. I’ve been to the movie theater 3 times. I’ve canned jam. I’ve learned more about what’s important to me and what’s not. It feels like home here. 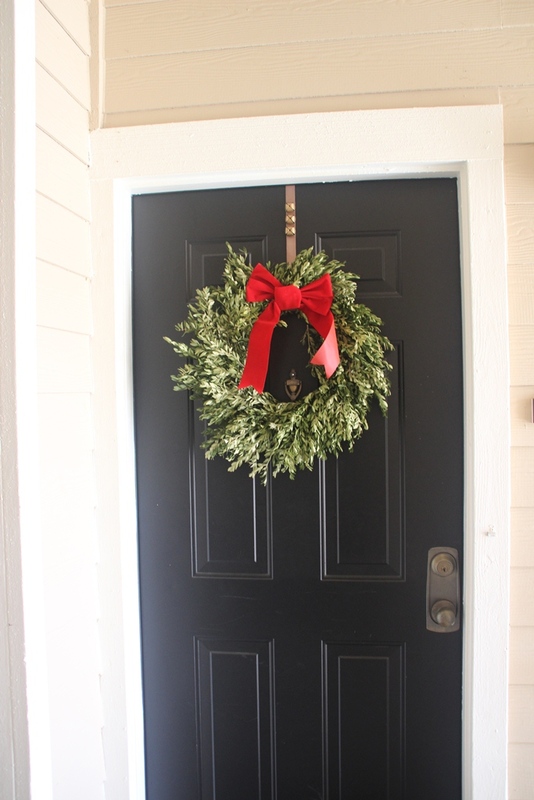 I think it’s time to take down this wreath. I’ve been up to a lot lately that I will post about when I have some free time, which will be on the fifth of never. Just kidding. Kinda. Even though these posts won’t be in chronological order, I thought I’d share my Easter while it’s fresh in my noggin. My dear little sister, Eugene drove down from Lexington, Kentucky to join me for the holiday. I hadn’t seen her since Christmas, which seems ridiculous since she lives only three and a half hours away. She arrived last evening and we went out to dinner at Germantown Café, which we had been to last summer for brunch. 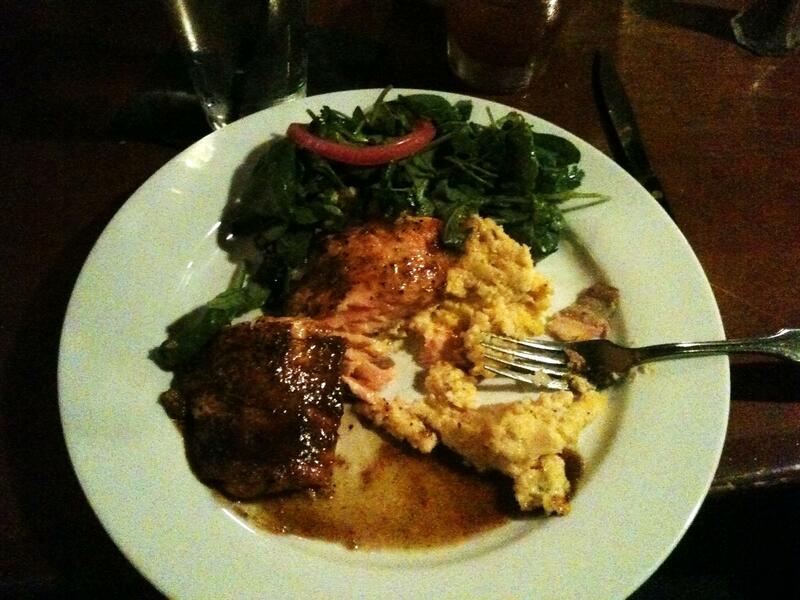 The brunch last year was fabulous and dinner certainly didn’t disappoint. My friend and her sister joined us and we ordered two appetizers to share: pork belly tater tots and fried green tomatoes. I normally don’t like tomatoes but I didn’t mind choking these down one bit. They weren’t half-bad; in fact, they were more than half-good. The pork belly tater tots were slightly smoky, but not overwhelmingly so, which was good. I’m not a huge fan of smoky things, including cigarettes. They were very rich but quite tasty. For my entrée, I had the fish special, which was a panko-crusted tilapia with a Puttanesca –like medley over parmesan polenta and asparagus. If there is ever a fish and grits/polenta dish offered at a restaurant, I will most likely order it. It’s one of my favorite combinations ever. This wasn’t the best I ever had, but it certainly hit the spot. We moved on to Holland House for drinks/dessert. I ordered a drink on our waiter’s recommendation that wasn’t on the menu. 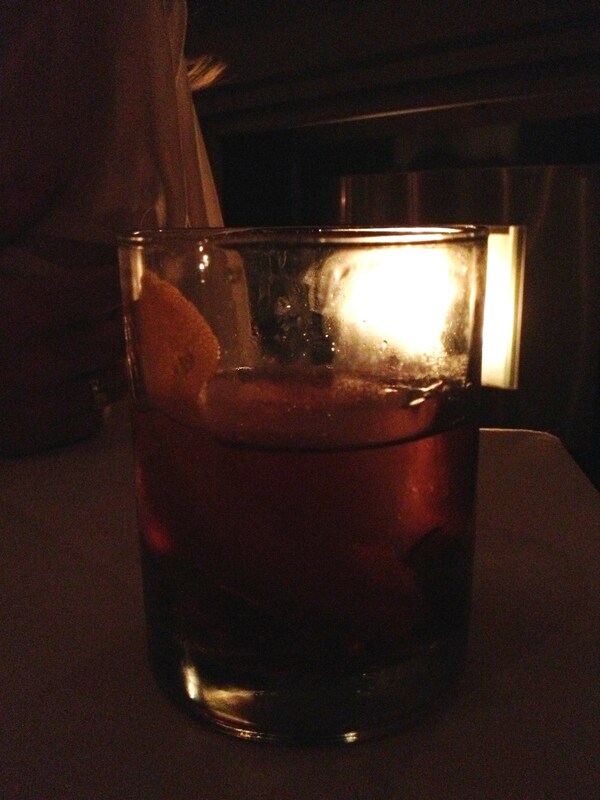 I don’t recall the name, but it was a bourbon-based concoction that tasted like fall in a tumbler. Fall is my favorite season and bourbon is my poison, so I definitely enjoyed it. It didn’t hurt that Holland House is such a neat scene with its dim-lighting and parlor-like feel with just the right balance of rustic and refined décor. Initially I had wanted to sit at the bar to people watch and observe the theatrics of the bartenders making their artisan cocktails, but it worked out that we were seated by the fireplace since it was a cold, rainy night. We ordered dessert to finish off the evening. My sister and I split a flourless chocolate cake with a scoop of homemade carrot cake ice cream. The dessert wasn’t as spectacular as the drinks, but all in all, it was a fun evening. After church this morning, my sister and I headed over to Pancake Pantry, which I have been wanting to try since I moved here. I was forewarned that there would be a line down the sidewalk and today was no exception. Poor Eugene toughed it out in the rain with me, each of us with a malfunctioning umbrella and no outerwear, for about 45 minutes. Thankfully, the food was worth the wait otherwise I think she would have killed me. 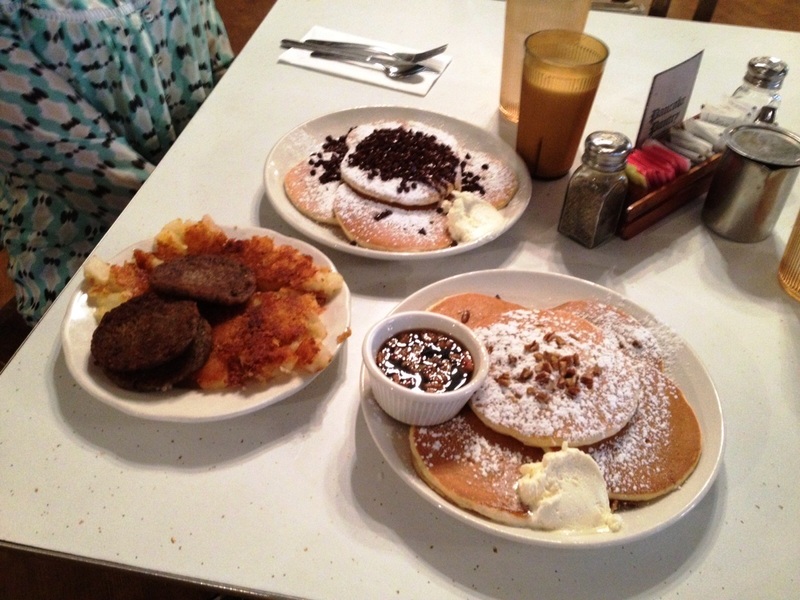 She ordered pecan pancakes and I ordered chocolate chip. We also rounded out the meal with an order of sausage patties and hash browns. The pancakes were superb and the sausage was the good stuff. The hash browns, while good, were clearly crisped up on the griddle with Parkay margarine. I know this because Parkay has a very distinct flavor which I first experienced as a child when I insisted we purchase the Parkay spray margarine I had seen on TV because it looked like fun to use. It is not tasty and I’m going to have to dock Pancake Pantry a few points for this faux pas. They have a good thing going with their pancakes with whipped butter, though. In my typical fashion, the visit was centered around food. Eugene didn’t seem to mind and I didn’t have to cook. 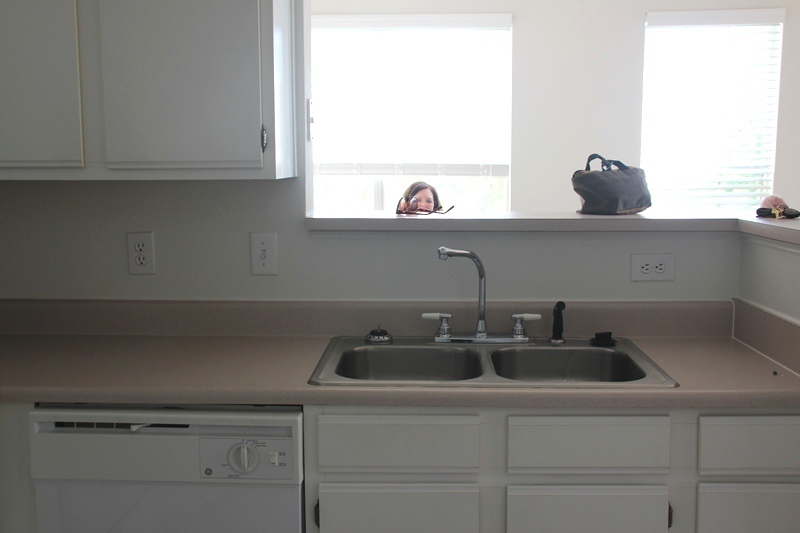 Not that I mind cooking, but I still don’t have barstools so there isn’t a proper place to sit and eat a meal in my apartment. I’m working on it though. Thank goodness Nashville has a lot of great restaurants. 19 driving hours, 1150 miles and 8 states later, Amarillo, my mom, my dad, Gus, Scarlett and I arrived in my new hometown of Nashville, Tennessee. My dear mom and dad, as well as Amarillo (my moving truck that I grew attached to) were along for the journey to help me move. Although my cat Gus meowed constantly for about an hour straight after we left, the cats traveled much better than I thought they would. I think their pleasantness had a lot to do with my ingenious set-up for them in the back of my car. 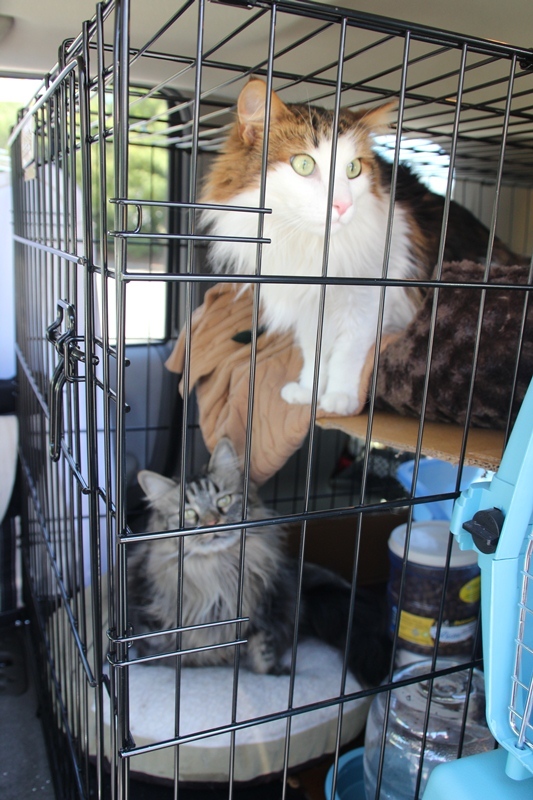 I purchased the largest animal crate that would fit into the back of my Jeep and used the divider (intended to be used vertically) to create a mezzanine level so the cats wouldn’t be on top of each other. Scarlett took the main floor and stretched out in the camper while Gus opted for the upper deck and was able to see out the windows and enjoy the scenery. I realized about an hour into the trip that Gus’ blanket (“the mommy”) was outside the cage so at our first rest stop I put the blanket in his bed in the cage. He snuggled right in and the meowing abruptly ceased. What a weird cat. 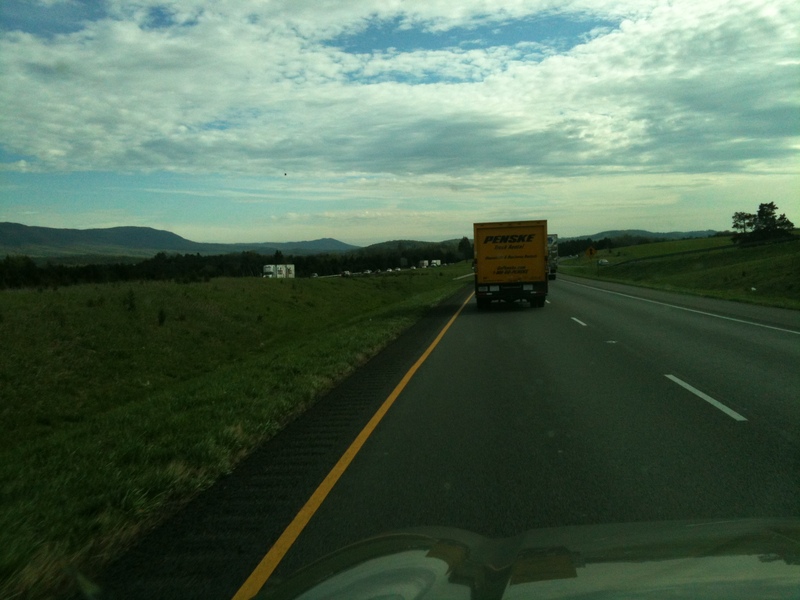 They were much more relaxed when we were moving at a steady pace than when we were stopped. I think the might have thought that a stop meant we had arrived at the vet’s office. They do not like the vet. 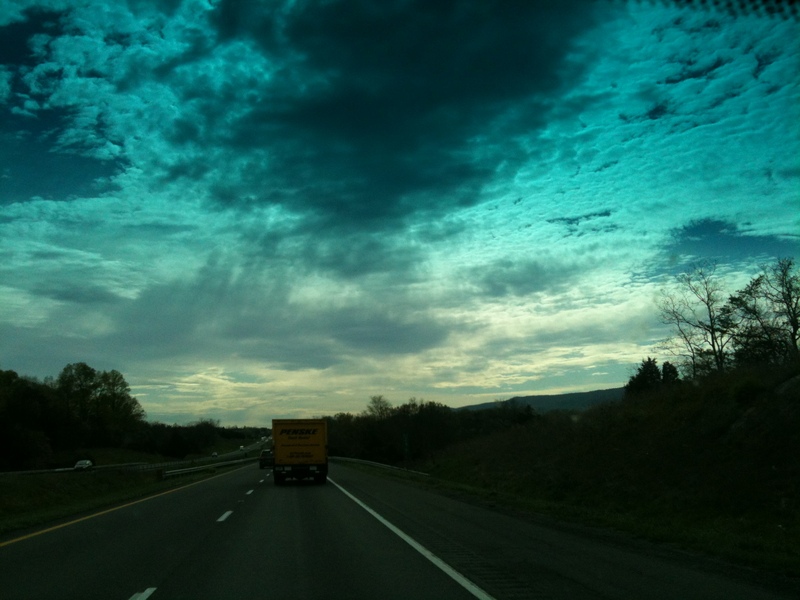 The drive was especially beautiful in some of the states we passed through, particularly Virginia and eastern Tennessee. This was my view for about 500 miles. Not too shabby. I love me some hills. This was a very pretty sky. I can’t remember if this was late Thursday or very early Friday. It’s all a blur. 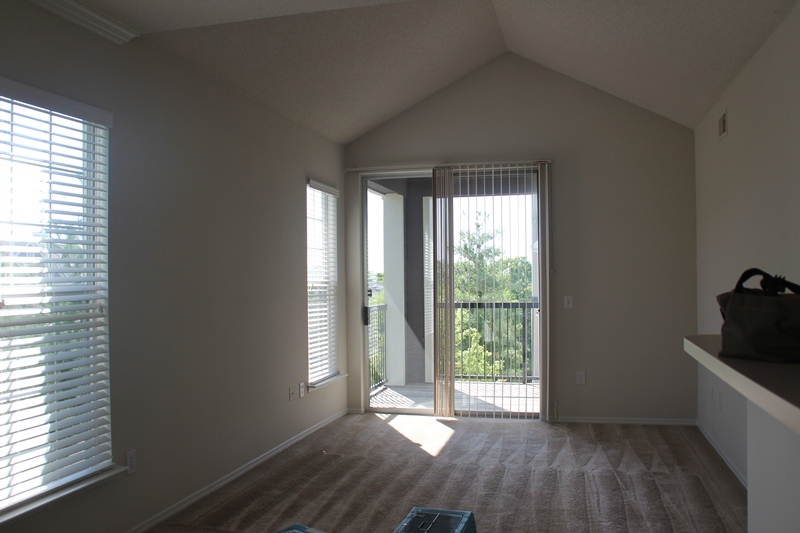 Here is my naked apartment right after I signed my lease and my life away. Love the pale pink counter tops. Not. I will be painting as soon as I have some energy after packing up, driving across the country and then unpacking my life. Maybe I’ll feel up to it by the time my lease is up. My seeeester, Eugene, and my cousin Lauren drove down from Lexington, Kentucky (where they both go to school with the 2012 NCAA Men’s Basketball Champions. No big deal). 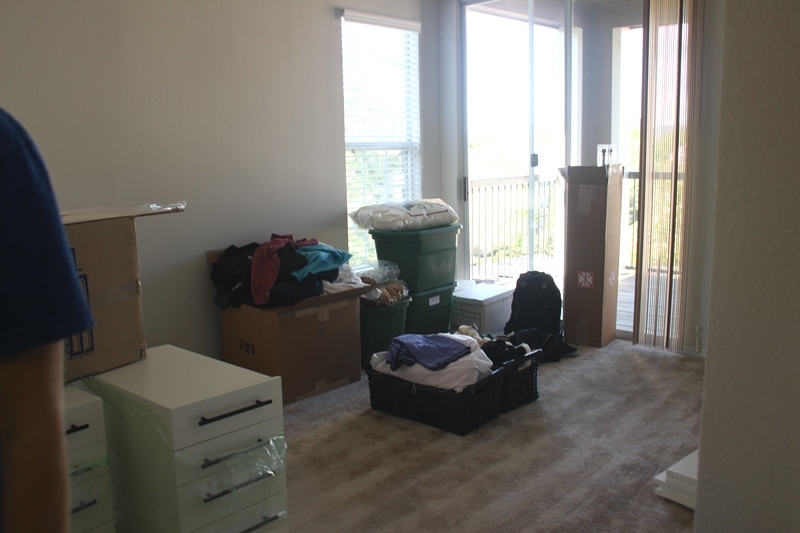 They were such great helpers and I really don’t think I could have gotten everything carried up into my 3rd floor apartment and pretty close to set up without them. I think I’ll keep them around. I tried to get them to stay at my apartment but they gave me some spiel about having to get back to school for class. Lame. Who could say no to this? After a few hours of unpacking the truck and carrying my ridiculous amount of stuff up to my apartment on Friday, we were all starving and we went to one of my new favorite spots in Franklin called Sol. It’s kind of funky Mexican or Mexico meets the South or something like that. Whatever you want to call it, it is obnoxiously delicious. We started out with some freshly made table-side guacamole. YUM. As our entrees were ready to be served, our waiter took the guacamole bowl and I was very displeased because I had not yet scraped the bowl clean with the homemade tortilla chips so as not to leave a morsel of deliciousness behind. I quickly got over my outrage as soon as my dinner arrived. I ordered one of the evening’s specials: chipotle honey pan seared salmon with herb and parmesan polenta (and some sautéed spinach that I ignored). This was heaven on a plate. I have a picture that will surely make you hop in your car and drive however many miles (it doesn’t matter how many) to taste a bit of this wonderfulness. After dinner, we were all drifting off into food comas and wanted to pass out. Eugene, Lauren and I had to make a quick trip to Walmart, however, because I had no food in the house and no couch for my sister or cousin to sleep on. As with all Dyer Walmart trips, this was an adventure. We were delirious at this point and must have circled the bedding department 43 times before I made up my mind on which sheet set and blanket would coordinate best with my décor (even though they were going on an air mattress). Her parents might find this statement troubling, but I thought it was hilarious. We got back to my apartment and Lauren blew up the air mattress (inflated it, rather. She didn’t explode it. That would have been real bad). And then we all passed out at the thought of more unpacking the next day.